(SPACE.com) The sun is unleashing some powerful solar flares today (July 4) in an impressive celestial fireworks display just in time for the U.S. Independence Day holiday. 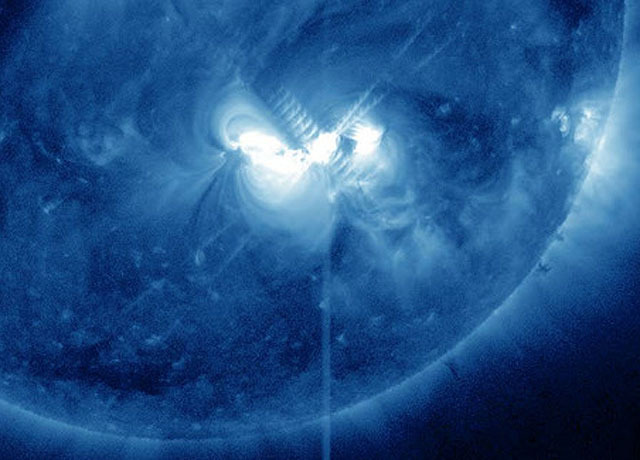 The latest solar flare erupted at 5:47 a.m. EDT (0947 GMT) and hit its peak strength eight minutes later. The flare fired off from the active sunspot AR1515 and registered as a class M5.3 solar storm on the scale used by astronomers to measure space weather, according to the Space Weather Prediction Group operated by NOAA. Class M solar flares are powerful, but still medium-strength, sun storms that can supercharge northern lights displays on Earth. The weakest of the sun's strong solar flares are C-class storms. NASA's Solar Dynamics Observatory spacecraft currently watching the sun also captured another solar flare this morning that reached M2 on the sun storm scale. "As the United States is observing Independence Day, active region 1515 unleashed another M2-class solar flare," SDO scientists wrote in an announcement posted to the mission's Facebook and YouTube sites. The flare peaked at 12:37 a.m. EDT (0437 GMT), they added. Sunspot AR1515 is a huge active region on the sun that reportedly covers an area 62,137 miles long (100,000 kilometers). It has been responsible for a series of strong solar flares in recent days and may not be finished with the Fourth of July yet. "The chance of an X-flare today is increasing as sunspot AR1515 develops a 'beta-gamma-delta' magnetic field that harbors energy for the most powerful explosions," announced Spaceweather.com, a space weather tracking website run by astronomer Tony Phillips. "The sunspot itself is huge, stretching more than 100,000 km (8 Earth-diameters) from end to end." X-class solar flares are the strongest flares the sun can unleash. When aimed directly at Earth, X-class solar flares can endanger satellites and unshielded astronauts in space, interfere with GPS signals and communications, as well damage power system infrastructure on the ground. Phillips and Spaceweather.com said that today, Earth will be in the crosshairs of any major flares. "If any X-flares do occur today, they will certainly be Earth-directed," they explained. "The sunspot is directly facing our planet." The sun is currently in the midst of an active phase of its 11-year solar weather cycle. The current cycle, known as Solar Cycle 24, is expected to peak in 2013.